One of the premier Copacabana Hotels in Rio de Janeiro, the excellent JW Marriott Rio exquisitely captures the enrapturing spirit of Rio de Janeiro. Guests will truly feel on top of the world as they soak up Rio’s magic from the hotel’s rooftop terrace and enjoy breathtaking views of the Sugarloaf Mountain and Corcovado from the swimming pool. Copacabana’s newest 5-star hotel, the JW Marriott Rio does not fall short of attractions with a Spa & Fitness Center, Mediterranean and Japanese gourmet restaurants, and a fully equipped business center. All 245 rooms are equally luxurious, elegantly furnished and feature the latest modern amenities, including wireless Internet, phone, work desk, 24-hour room service, newspaper delivery, and much more. Awarded by the World Travel Awards as “Brazil’s Leading Hotel” in 2009, and voted as one of the “World’s Best Places to Stay” by Conde Nast Traveler, the JW Marriott just has everything to offer for your utmost comfort and to make your stay in Rio an unforgettable experience. The Windsor Atlantica combines the luxury amenities of a 5-star hotel with an enviable location in Rio de Janeiro. Situated on the shore of Copacabana Beach, this skyscraper hotel occupies the tallest building in Rio. Guests have access to 2 restaurants, 2 swimming pools, a lavish spa, and fully-equipped fitness center. And Rio’s top attractions – the Christ the Redeemer statue, Ipanema Beach, and the iconic Sugarloaf Mountain (Pão de Açúcar) – are just a short distance away. Refined simplicity set to a bossa nova beat: this is Sofitel Rio de Janeiro’s approach to Brazilian hospitality in one of South America’s most exciting cities. Located at the midpoint between the beaches of Copacabana and Ipanema and offering a full range of luxury amenities, this 5-star hotel in Rio de Janeiro provides the ideal setting from which to take in the leisure and glamour of the carioca capital. Located right on Copacabana beach, the Copacabana Palace is South America's most famous hotel and has welcomed the rich and famous since 1923. There are 146 suites and 75 Standard rooms all immaculately furnished and oozing luxury. The hotel also boasts a magnificent semi-Olympic swimming pool (the finest in Rio), a tennis court, and a well-appointed fitness center. Water sports nearby include surfing and body boarding. It is also possible to cruise and snorkel around the offshore islands as well as play golf, beach volleyball, beach football (soccer), and other sports. A member of the Windsor chain, the very pleasant Excelsior sits on a wide corner offering excellent ocean views. Rooms either have a side view (superior) or a full ocean view (frentemar). All are elegantly furnished, spotless, and very well maintained. The best rooms are the deluxe suites that take up the entire corner and offer both side and full ocean views (luxo frentemar). The suites come with spacious bathrooms, Jacuzzi tub, flat screen TV, and a king-sized bed. The hotel also throws in free local calls, free parking, and an excellent breakfast buffet. The rooftop swimming pool and terrace are also great places to unwind after a long day of exploring Rio’s many attractions. The Mirasol Copacabana Hotel is located in a privileged area of Copacabana, just 1 block from the beach and near a subway station, with easy access to anywhere you want to go in Rio. The hotel's 94 rooms and Presidential Suite are decorated and equipped to offer the comfort you deserve, in a cozy and beautiful atmosphere. Mirasol Copacabana also offers many leisure options on its rooftop: a solarium with a breathtaking view to the beach and the mountains, swimming pool, sauna, and the excellent service of the Sky Sol bar. From the sauna, you can enjoy the dazzling view to the beach of Copacabana. Located just next to the Ipanema Beach, facing the sea and less than a block away from Garota de Ipanema bar where Bossa Nova was born, the excellent Best Western holds up to the reputation of this famous international chain. Ideal for tourists and executives due to its proximity to Rio de Janeiro's city business center and major tourist attractions, this hotel features excellent services and comfortable amenities. Whether your trip is for relaxing and indulging in the sun on the beach, or enjoying the nearby art galleries, theatre, or botanical gardens, the Best Western Sol Ipanema Hotel is the place to stay. From its panoramic rooftop terrace to its comfortably elegant décor, Porto Bay International lives up to the unique energy of the “Marvelous City.” Highly lauded for the friendly professionalism of its staff, this top-ranked hotel is an ideal base for travelers who want to combine the scenic setting of Rio Janeiro’s famous coastline with easy access to the highlights of this lively cultural capital. The Windsor Martinique Hotel is the newest budget option of the Windsor chain, offering excellent services at great value. Located just around the corner from the Miramar, the hotel is only half a block away from the Avenida Atlântica and within walking distance from Rio’s best shops, restaurants, and bars. The hotel comprises 2 buildings gutted and joined together, making for some maze-like hallways, and is brand new, offering top-notch and modern amenities. It also boasts a rooftop pool and sun deck. Located between Ipanema and Copacabana on a quiet residential street, the Atlantis Copacabana Hotel is perfect for those who like to see it all. Both beaches are within minutes from the hotel, and shopping and restaurants are easily accessible as well. The hotel offers simple yet comfortable accommodations, and some rooms are dotted with beautiful views of the ocean. 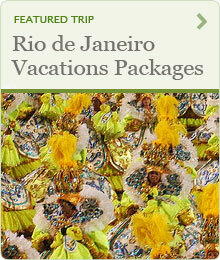 Recently renovated, this hotel offers excellent services at great value and is the ideal base for your Rio explorations. The Mar Ipanema Hotel is located in the heart of the famous and colorful Ipanema district, about 100 meters away from the beach. This district does not fall short of attractions, with the Rodrigo de Freitas lagoon, movie theaters, chic boutiques, a modern shopping mall (Fórum Ipanema), fine restaurants, fashionable bars, and charming arts, crafts, and flower fairs. It takes less than 5 minutes to reach Copacabana and 20 minutes to the international airport or downtown. This excellent hotel features 86 rooms all elegantly decorated with Rio de Janeiro motifs and fully equipped, including private bathrooms and wireless Internet. Tastefully decorated and fully equipped with all latest amenities, this hotel is the perfect choice for travelers looking for great value and comfort in Rio. The Copacabana Mar hotel is ideally located in the heart of Rio de Janeiro, only 3 blocks away from the beach and close to the subway and downtown Rio. The hotel boasts 96 comfortable rooms all equipped with a private bathroom, air conditioning, cable TV, minibar, and safe deposit box. Among the other great facilities of the Copacabana Mar, guests will also enjoy high speed wireless Internet access throughout the hotel, a cozy bar perfect for a relaxing drink after a long day, rooftop swimming pool, fitness center, and excellent restaurant offering an array of delicious regional and international dishes. Just 14 miles from Santos Dumont Airport and 8 miles from downtown Rio de Janeiro, the Windsor Plaza Copacabana Hotel is conveniently situated among countless cinemas, shopping mall, bars, and restaurant options. It’s also only a few minute walk to the lively Copacabana Beach. The terrace is a delightful retreat in the bustling city, with a swimming pool where guests can enjoy fantastic views of both the beach and southern mountains of Rio. A buffet is open every day of the week and offers tastes of some of Brazil’s most favorite dishes; an à la carte menu is also available. For those who want to get active after a long day lazing on the beach, head to the sauna or fitness center. This practical yet cozy hotel is a great choice for guests who want easy access to the diverse entertainment facilities of the Rio beachside.